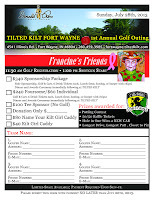 Titled Kilt Fort Wayne announced its first annual Golf Outing on Sunday, July 28th at the Donald Ross Golf Club, 4541 Illinois Road, Fort Wayne, with proceeds going to Francine's Friends. Golf registration begins at 11:30 am, with a 1:00 pm Shot Gun start. 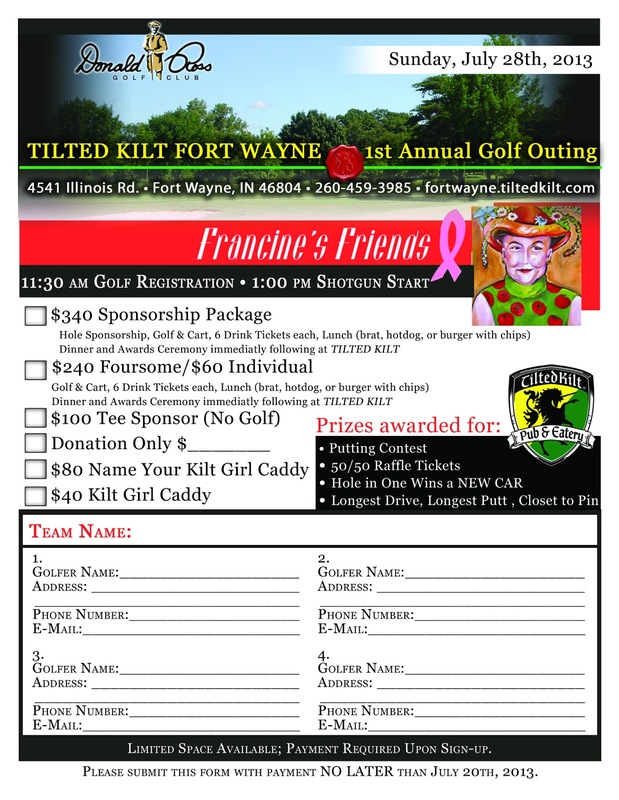 team packages, tee sponsorships, and kilt girl caddies. Prizes will be awarded for Longest Drive, Longest Putt, Closest to the Pin, and any hole in one wins a NEW CAR! Straight donations will also be accepted at the Tilted Kilt between now and the golf outing. 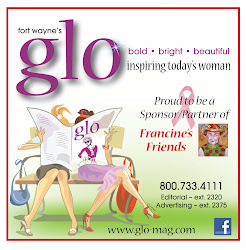 Registration deadline is July 20th, 2013. Click here for more informatoin, or contact Carmen Hammons, general manager at Tilted Kilt at (260) 459-3985 or email: chammons@tiltedkilt.com. Many thanks to our friends at the Tilted Kilt for their support!